In Hot House, last week's episode of City Homicide, two mathematicians were murdered. We helped murder them. It's not every day that we get asked to participate in a TV drama. And we're actually in the business of collecting and documenting maths in the movies and on TV: you can tell from our Maths in the Movies webpage, and note in particular the large number of murderous and murdered mathematicians. So, when City Homicide contacted us, asking for help, we jumped at the opportunity. Initially we were approached by Kate and Slavko, in charge of props for the show. There were mathematicians to be murdered, and they wanted some help in dressing the sets: providing maths books (boxes of them), filling whiteboards with equations, and so on. In the end, we became quite involved. We checked the maths in the script ("Ree-man, not Rye-man"), supplied tons of maths props, and spent three days on set, ready to assist with any mathematical emergency. We met the stars, chatted with Kate the director and her crew, decorated the corpses: all great fun. The filling of the boards was a lot of work. The first victim was a professor of mathematics, interested in the Riemann Hypothesis: a famously "unsolvable" maths problem. So, we dragged out some high-level number theory texts and scribbled away. We included lots of the Riemann Zeta function and related equations, most of which we didn't really understand. 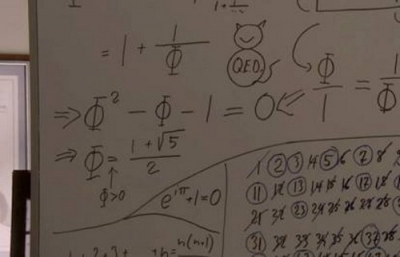 Burkard Polster and Marty Ross' equations decorate the set of Channel Seven's City Homicide. We also needed to fill the whiteboards of a young student. Those were easier and more fun, and we made sure to include as many gems as possible: the golden ratio, the sieve of Eratosthenes, 0.99999... = 1, and many more. And, we made sure to include a very prominent QEDcat in the middle of the board. We're delighted that our mascot has now made it to the silver screen. QEDcat makes its television debut. The real fun was in decorating the corpses. The story includes two mathematicians who are forced to write equations on themselves; they get stabbed wherever they make a mistake. We had to write the equations on the bodies, and again we chose mostly Riemann Zeta material. Our two bodies - and Luigi, the practice body - were very friendly, and very tolerant of our crawling over them in order to write the equations. The whole episode can still be seen until Wednesday at the City Homicide website. You can also go to our website, where we discuss all the little mathematical details, and the minor mathematical bloopers. The whole experience was terrific. The cast and crew were incredibly professional, and engaging and friendly and fun. 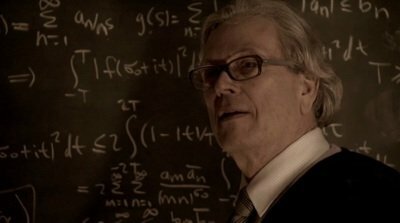 If someone ever asks you to kill some mathematicians on TV, our advice is to definitely go for it!